CommuniTEA took place last Wednesday night in the Factory. Across the dark courtyard you could see the buzzing dance room, lit by fairy lights, inviting you in. CommuniTEA was the second event in a series of three organized by Pankow Conversations. In an attempt to bridge differences of opinion, the events provide a space for the college to connect to its neighbors. Each event has a central theme. Can you guess this one’s? 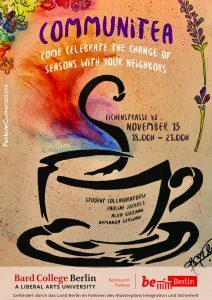 The event’s slogan was not “What does community mean to you?” Or “How do you define community?” Instead it was simply: “Come celebrate the change of seasons with your neighbors.” The slogan embodies the event’s focus. It centered on its activities rather than discussion. Questions of community and neighborhood were integrated into the activities. 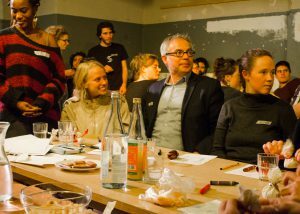 The event’s format was fragmented and informal. There were three different workshop stations, and people were free to choose which one they preferred. Bowls of chips and chocolates on the tables, a vague smell of parsley in the air, and late 90’s pop hits playing in the background contributed to the ambience. “I could not identify who was from Syria, who was from Germany, who was from the United States. That was really something amazing,” said Asmaa Aboyousof, an Egyptian journalist. She came to cover the event for Amal, Berlin! and ended up staying much longer than intended. “It’s like Rosa Luxembourg said: ‘I’m from the whole world.’ You know this feeling you have, that you can just go and communicate with people on a very human and a very nice basis. That was my feeling. Maybe I am exaggerating, but that was my feeling,” she continues. Alva and Asmaa were not the only ones who enjoyed themselves. The event ran longer than expected and, when it was time to clean up, the music was simply turned up and the party continued. “We had to improvise and really work together, which created this bond. And then, of course, we enjoyed the food together,” says Pauline. These conversations are important; we need to take the space to recognise each other, person to person. “Sometimes, when you introduce each side to the other, it works. It could change their mind and their stereotypes about immigrants, refugees, newcomers or foreign students,” says Asmaa. “Adults having conversations with younger people in a non-hierarchical setting was very, very refreshing,” adds Alva. Whether they were newcomers or long-time residents, young or old, the event provided a space for everyone to meet on equal footing. The only thing left to do was listen. 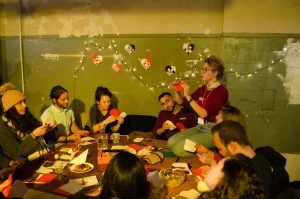 Instead of defining or discussing community, CommuniTEA was the experience itself. Among the tumult disagreement creates, it’s difficult to remind ourselves of our commonalities. It may sound utopian, but we must take the space to listen to each other. Creating an environment where all of us feel comfortable and safe enough to share our stories, preferences and differences can help us find common ground. If there’s one thing we can all enjoy, it’s music. That’s why on Saturday the 2nd of December, as their final event, Pankow Conversations is organizing an Open Mic in the Factory. Come sing your song, tell your joke, or slam your poetry. The stage is yours.